The Hermitage session tonight consists of 6 x 500m sprints on ergs for the boys and Arran will be doing a circuit with the girls. 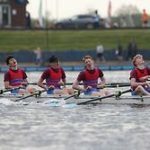 This photo of the j15 boys quad epitomises what last weekend was about. A large number of you made the coaching team proud and all for our brilliant club. I saw people being unselfish, sharing food and water with teammates who needed it, lifting each other’s boats when we were tired. Basically we won all of the medals for the Northern Team. If we were a region we would have finished 10th! Our GB trialists were outsiders going in to the trial today, Dan was four seconds from being picked to Row at Euro… Champs, Bobbi was one place away from Euro champs finishing an agonising 17th. Eve after six months not being in a boat performed well finishing in the top 20 in the time trial. Thanks to Arran Lewcock who spent two full days in Nottingham looking after our kids, he will now officially be sick of rowing. Now for Brit Champs… hard work coming, crews nearly decided. Our regatta takes place on Sunday and T-shirts are on sale from tonight for £8.50 at the Hermitage and anywhere you see Bob Young this week. I have been told that the popular sizes are going fast so please be quick. The draw for the regatta with timings is below and our crews are attached, there have been some changes so please check carefully and not shoot the messenger. This year we had over 300 entries, which is far too many for one day so we have tried to limit members to no more than two events (some have three but they are lucky), this Saturday and indeed through the week, we need to tidy as much as possible. British Junior Championship entries are in the planning and will be circulated this week. Finally, if anyone knows anyone who is interested in rowing, please let me know as Louise is running another senior learn to row course.